Club Penguin Cheats by Mimo777 Club Penguin Cheats by Mimo777: Club Penguin Mountain Expedition Yeti!? Hmm, possibly a Yeti Cave? Do you think the Yeti (or whoever lives in the cave) will show up during the Mountain Expedition? I sure hope so! i think it is herbert! Once he disguised him self as a yeti! He has got big foot! It could be a yeti. It could also be Herbert. Remember in the DS game his balloon went outa control at the end and we didn't know where he went to? His balloon could of crashed on the mountain. Also, remember last weeks issue of the Club Penguin times. The two Jet packers said they saw something out of the ordinary on top of the mountain. It could of been Herbert's crashed balloon. rember when he was in the yeti costume!!!!! Maybe Herbert lives there!Or maybe Big Foot?! cool! really hope so !!! A good mystery to go along with it. And this room provides the perfect mystery! I think its awesome, if it was a yeti cave or something... the mountain expedition would be even better if that idea is true! :D My yeti "costume will definitely come to use if thats true... which i hope it is!!! Yeah, I had that same thought as well. 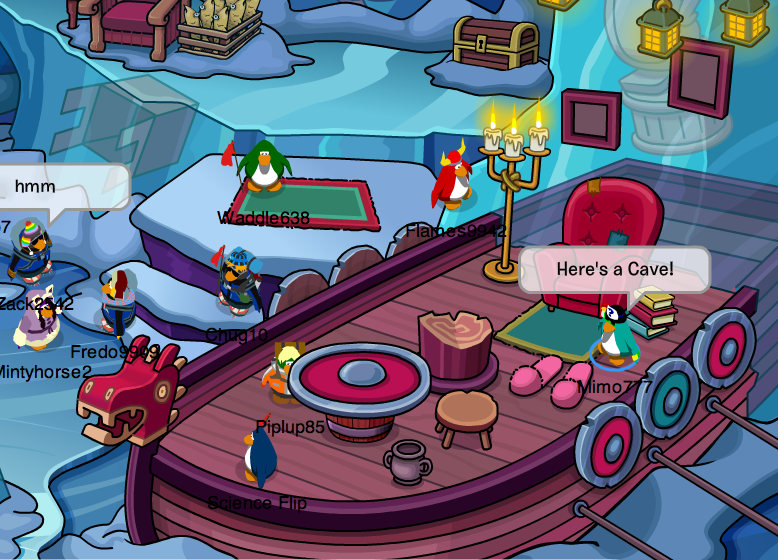 Plus, CP said on a blog a few months ago that Yeti Caves would be appearing around the island. I wonder if you sat there for awhile if something would come. i think it could be where herbert lives, that would be sweet! Yup. That's what I think too. I wish non-members could access the expedition too, after the members are done, of course. I love this party, by the looks of it of course. I'm not a member, but its these times I wish I were. :'( If I had to choose a favorite special location it would either be this one or the medieval times party. 2. 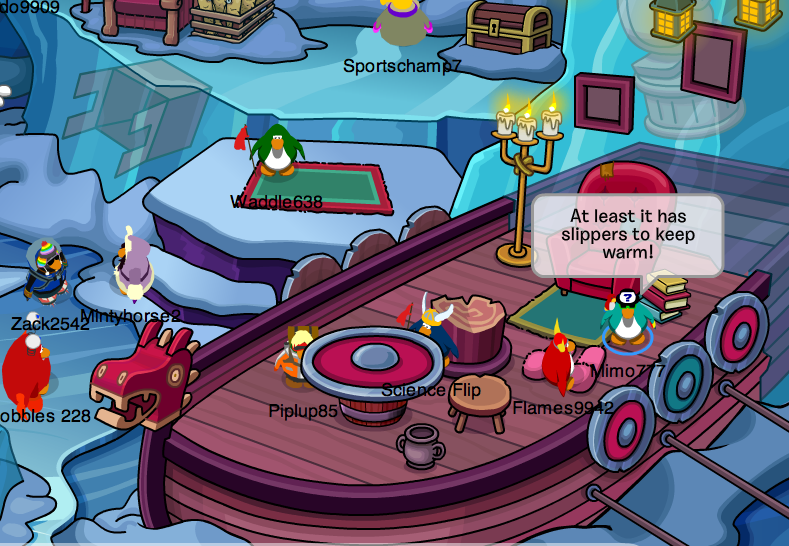 A new creature coming to CP! I remember that! Also, those slippers keep him warm! :O What could this mean? Herbert is buying from illegal shoe dealers? Lol! Scamper is smarticle... Bobhead no understand smarticle people. Bobhead get smart monkey to translate. Mmhmm... Hmmm... Oh! I bet you're right! There isn't anything currently out of the ordinary there! Maybe it WAS his balloon! No, couldn't be Bigfoot. He's not real. That was just me. I have REALLY big feet. I'm talking size 83. Lol! Doctors say I have a serious foot problem. I got mad and stepped on them. I do too! This party wasn't too exciting! So I hope a Yeti comes! Or Herbert! A new mission? I'm not sure. I smell a new party-mission-expedition thing! One time Herbert actually dressed up as a Yeti! So it may link up to Herbert! Now I want to get in the Yeti costume and jump out of nowhere and scare the twinkies out of everyone. LOL. I bet! I wonder how many coins a home like that cost.. LOL. I would like to move there. But seriously that would be pretty awesome! I didn't know that! Pretty sweet! I shall Ding-Dong ditch all Yetis! I hope I earn a stamp. Hehe. Maybe. Or maybe it comes every hour like the orange puffle! The Penguin Play awards already came this year. So I think that's out of the options. I bet it's Herbert planning REVENGE! Sweet revenge! Muahahaha! LOL! I agree, probably where Herbert lives! Or the lair of Doctor Gatorade! Come on! Nobody's with me? Doctor Gatorade? How do i get there i am a member??? i need help!! This might only be me, but when I post like 4 or 5 posts, only 1 or 2 come out. oh cool! And also: The new background is animated! First animated background! And remember that newspaper with herbert and he looked like a yeti? this could be him! Maybe if it comes, the path will be opened. I think the "it" is herbert! i think it's herberts hideout and we have to do field ops to make him move, so we can enjoy the rest of the mountin expedition. remember the cave expedition? It Stayed so the mountain might to! maybe, club penguins got an idea of something like yeti's could be our rivals. Or you can be a yeti and a penguin! Or There making a new virtual world called "Club Yeti". 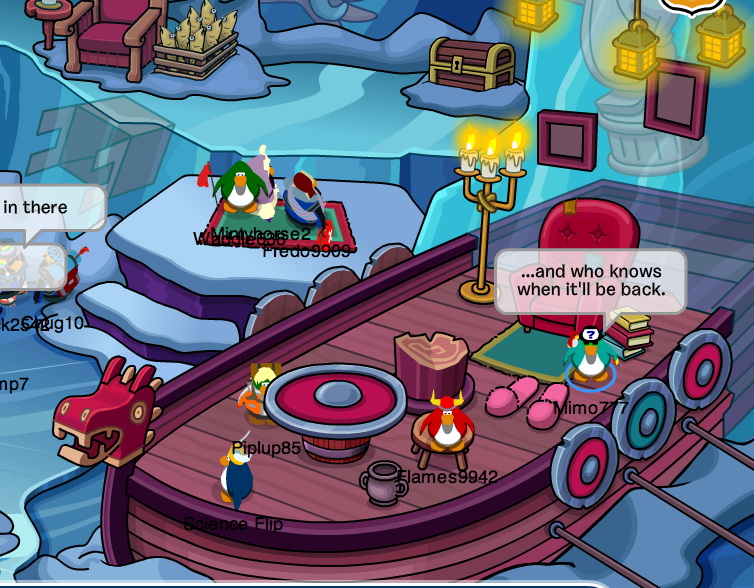 Mimo, in the ice blocks, there's a giant Penguin Play Awards trophy! What's up here? And in one part of the Mountain Expedition, there's a Cart in some ice! "It could be a yeti. It could also be Herbert. Remember in the DS game his balloon went outa control at the end and we didn't know where he went to? His balloon could of crashed on the mountain. Also, remember last weeks issue of the Club Penguin times. The two Jet packers said they saw something out of the ordinary on top of the mountain. It could of been Herbert's crashed balloon." I tottaly agree with that, and maybe our next field op is to track down herbert and klutzy! ALSO, there is a big box of fish in the secret cave too, and polar bears eat fish!! I can't find tht hide out anywhere.. can someone please help me ? Mimo, how did you give a tour wearing a parrot and sunglasess? 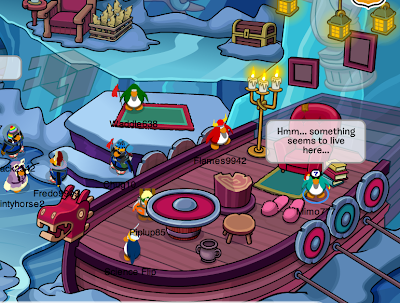 That looks like the boat from the boat battles at the adventure party! Maybe herbert has something to do with that cave. ~~~~~~~~~~~~~~~~~~~~~~~~~~~~~~~~~~~Anonymous you know where the icicles are. Look into the lower right hand corner and click the icicle. Then go threw. I'm thinking that maybe our next field op will be diffrent than the other ones. Maybe the System Scanner will find some bugs leading to herbert in his cave. I'm not sure. This might only be me, but when I post like 4 or 5 posts, only 1 or 2come out. it to show up on his comments. i smail a mission or a new rooms !! Yeah, once you finish it, most people got pretty bored. They should have made it cooler, longer, and with more puzzles! I personally had fun playing at Base Camp, helping other people out! Knowing our luck, yeah it's him. It's easy, go to the icicles, when you finish that, go to the next room, you see a camp. Go to the next room after the little camp. Your at the second challenge, at the bottom right corner of the room, there's a cavern and it has ice, just walk right through. Herbert crashed his balloon, didn't he??? Hello, earth to Mimo! Or Planet Zarkoff, wherever you came from. It's gotta be Herbert. I belive that it's Herbert because remember the Snow Maze(I didn't do it , I just heard about it), you get a Yeti Costume(If you complete it). Remember when one newspapar had a Yeti in it? He looks like Herbert. Plus, big slipper? One word- Herbert! He created this! This is his new hideout! HERBET! i think its totally HERBET!!! Maybe we will have a new rival!!! Herbert and maybe the Yeti might team up and try to destroy the island!!! My dog died Today. We had to put him to sleep(Take to vet and inject with something that makes him, You know. Totally painless). So im really not in the mood to Comment but i did. Its hard to get used to it without him. He was 12 years old. Anyways its probably herberts hideout. DOCTER GATORADE?!?!?! O MY WE HAVE TO SAVE EVERYONE FROM COLORFUL DRINKS!!! hey mimo check out the stamp book it has a new portion called consoles there is the wii thing there to its pretty cool. Hey Mimo! Just wanted to let you know that the double coin bonus in games has gone back to normalwith no double coins. LOL! That would be awesome! And you can go to each other's worlds for battles and if u dont want to get hurt as a penguin, u can disguise urself as a yeti and vice versa! That would be awesome! We have club PENGUIN toys so would yeti toys come out? that would be pretty funny. And their pets would be crabs! Oh yeah! Wait, they did? Thanks for reminding me. i think that just might be it because this mountain climbing is BORING! I like the maze better. U get a yeti costume! mimo when the server chrashed when i went back on penguin that just became members had gotten the golden night armor and stuff from past like the red and white striped shirt everybody is gettin stuff like mad soo much fun i dont know how clumpenguin screwed this up ! It can't be herbert or yeti.... because they both have fur! Why do they need fuzzy slippers when the have fur?! if you didnt know this the new backround you get for getting to the top moves! Scamper52596 said...It could be a yeti. It could also be Herbert. Remember in the DS game his balloon went outa control at the end and we didn't know where he went to? His balloon could of crashed on the mountain. Also, remember last weeks issue of the Club Penguin times. The two Jet packers said they saw something out of the ordinary on top of the mountain. It could of been Herbert's crashed balloon. Yea I think your right because the balloon went off to the mountains so it could be herberts cave! hmm new Feild Op or maybe the first EPF mission! I also think it's herbert hideout! I hope it will say in the field op! I was looking through the stamps, and i found a new stamp section! Under games it says Console, and under console it says Wii. I wonder if this means you'll be able to transfer stuff from the new club penguin wii game. Either Herbert or a Viking! Because of the Viking boat! AND HES HIDING IN THERE TO MAKE MORE PLANS TO DESTROY THE EPF!! The music is NOT from Herbert's Revenge, I've played it all the way through. In addition, it is highly improbably that this is Herbert's Hideout, due to the Mountain Expedition being a member-only event. And it's even more unlikely that they would change it's status. Hopefully something cool will show up!.. If it is Herbert's hideout, gosh, he's a robber! No offense! THe first time you go in the cave, on your left, you'll see a Mine Cart! There will also be a sabertooth, fish, and a Penguin Play Awarth thingy! That amnimal that lives there like ice. Also, a sabertooth? lol Correcrct me if I'm wrong. It's all obvious. Just read one of the blogs on CP. Mimo, you probably should think of a different choice. And I belive HERBERT IS BACK!!!! RUN FOR YOUR LIVES!!!!!!!! HE IS REAKING HAVOC AGAIN and the EPF are the only ones who can stop him! 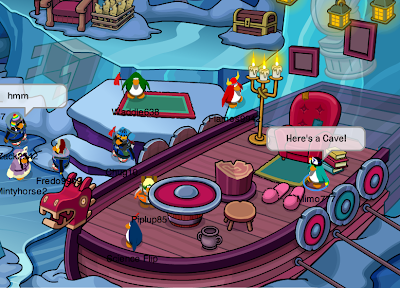 I have proof its not Herbert's cave! There is a box full of fish next to the chair! Remember Herbert is a Vegetarian! Im thinking Herbert, prehistoric puffle, or a new archeologist penguin. In the whats new blog there a red thing, possibly a creature from the ice. Or perhaps that the creatures in the ice some how go in the water and a new Aqua Grabber mission due to the fact that there will be new stamps. Maybe Mimo has super powers so that people cant see him! LOL! Don't talk in all caps. (Your hurting me and mimo's ears) And don't put to much ! or ? Okay? hey its herbert alright herbert always wants so he got some slippers! Mimo I don't think its a Yeti cave because we saw a Yeti cave during the great maze. Would we see the Yeti while we are dressed like it? I don't agree. I think it is telling us something that will happen later. In the top right corner is a frozen penguin play awards trophy. So the thing will probably happen then. Frozen underneath the throne is a box like the one in the play "The Penguins That Time Forgot." and there are weird, fang toothed sea creatures frozen in the ice as well so maybe we go back in time and see those creatures in the play. Herbert can't stop bothering us agents, can he? There is a new area in the stamp book called console. If you press on console you go to wii. Then you press wii and you go yo the club penguin game day stamps. Plz post. Plz give me credit for my last post. One word:Herbert! Rememberwhen his ballon went out of concrol? Maybe this is his new hideout! Awesome post Mimo! :D Keep on waddling! it's herberts other hideout! maybe in the next field opp herbert will try to blow up the mountain and theres hidden dynomite and you need to find it! that would be possible for that and the hideout! Mimo, I know for a fact it's Herbert! Think about it! 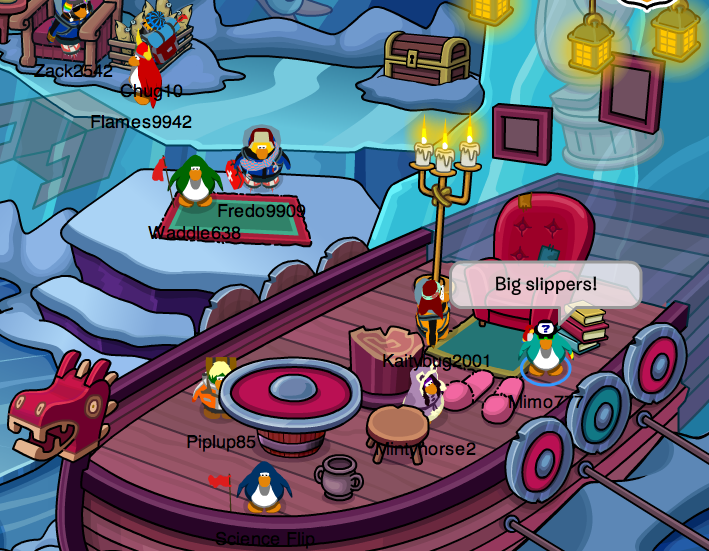 Big slippers, stuff that can hurt penguins, it's cold in there, he does want to freeze cp! More, Fish its his new secret hideout. MAYBE ITS A SNOW DOJO! you know that passway near the exit it might be frozen in ice and we will have fire ninjas melt the passage open and it will lead to snow dojo MAYBE ITS A ABOMINAL SNOW MAN!!! OR A GIANT PENGUIN OR SQUIDZORD!!!!!! wants to keep warm! which is why he has slippers!!! Why won't anybody think properly! What if it's a Club Penguin Tribe! Anyway, What HAS to make it so exiting. It might just be a simple passageway, and who lived there might be dead now! I Have Proof That it is NOT Herbert P. Bear Esq. hide out! Remember Herbert is a VEGETARIAN! So, WHY is there a box of Fish next to the throne? I think all of you are wrong! Have you seen the newspaper? 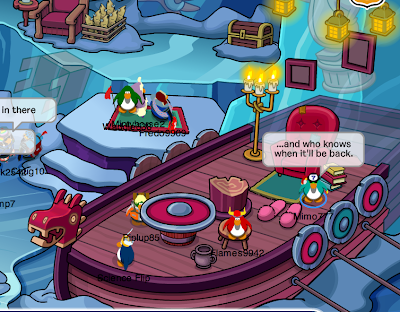 On the Ask Aunt Arctic page, it shows Rockhopper exploring a dark place, but in the background, you see a sandy island. Possibly Rockhopper island? The Mountain expedition was so fun! It took me two times to actually get it though...sadness that is, plain sadness... What is all this wee talk about a Yeti?